An incredibly profound observation of the effects of methylendioxymethamphetamine (MDMA) on octopuses was just published this week in Current Biology. The findings of the study titled, A Conserved Role for Serotonergic Neurotransmission in Mediating Social Behavior in Octopus, suggest incredible implications for how social behavior is built into the very molecules coded by our DNA. Researchers chose the octopus because they are one species on this planet that seemingly couldn’t be further from a human biologically speaking. As the study points out, Human and octopus lineages are separated by over 500 million years of evolution and show divergent anatomical patterns of brain organization. One of the major differences is the function and construction of the nervous system. The human brain and nervous system is centralized whereas the octopus has its nervous system decentralized and spread throughout the body which includes control systems in each arm in addition to a brain. Science has figured out that the feeling of ecstasy humans get when we ingest MDMA is due to the chemical’s ability to increase the activity of at least three neurotransmitters (the chemical messengers of brain cells) serotonin, dopamine, and norepinephrine. This increase in activity is what gives us the warm and fuzzy feeling that makes us want to be very close to people we may have just met when we take MDMA. The study wanted to see if MDMA had a similar effect on the octopus given the vast difference in their nervous system and behavior of being solitary and asocial creatures. The results were mind blowing. Gül Dölen and her colleague Eric Edsinger, the authors of the study, took this behavior to mean that in spite of our vastly different nervous systems, social behavior is built into animals on a molecular level, coded by DNA. 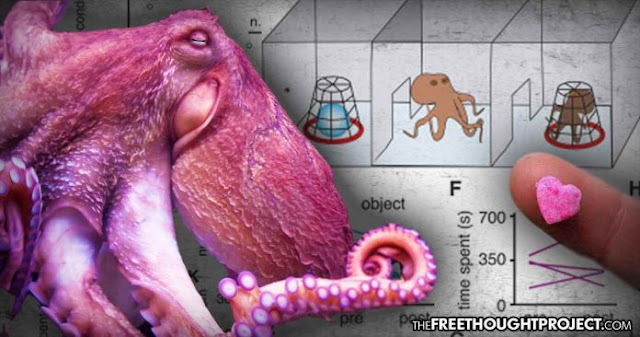 What’s more, the scientists found that when given too much MDMA — just like humans — the octopuses breathed erratically and turned white, illustrating that it may have been “freaking out.” However, Dölen noted that this behavior wasn’t written into the study as it teeters on the edge of anthropomorphizing the octopuses. But on lower doses, as Gizmodo reports, one animal “looked like it was doing water ballet,” swimming around with outstretched arms. Another spent part of the time doing flips, and another seemed especially interested in minor sounds and smells. Dölen was clear to point out that this study is only in its infancy and much more work needs to be done. But what it could mean in understanding how the brain evolved and how other species act in relation to humans is incredible. As TFTP has consistently reported, psychedelic drugs are only just beginning to garner the attention they deserve by the scientific community. Thanks to the erosion of decades of prohibition, the scientific community is finally discovering the profound effects of psychoactive drugs like MDMA, LSD, and magic mushrooms. In fact, just this past May, TFTP reported on a trial in the UK, led by a team of researchers at the Imperial College of London, which sought to determine whether MDMA can help alcoholics overcome their addiction. The results suggested that it actually could help. In other studies, MDMA has already been found to have positive impacts on treatments with PTSD, as well as relationship counseling. As TFTP’s John Vibes recently wrote, Psychedelics offer us a glimpse into the final frontier of humanity—the consciousness. With these substances, we can explore the human imagination with profound insight that will help us in our own personal lives and the bigger picture as well. We must push for new legitimate scientific research into the therapeutic uses for these drugs. These studies will prove, as they have in the past, that psychedelic compounds have many medical and spiritual uses that are necessary for our species to continue the evolution of our consciousness. And now, the octopus is becoming our unlikely ally in this journey.